This holiday liqueur is perfect for winter celebrations with friends, or to warm up with on cold, frosty evenings. 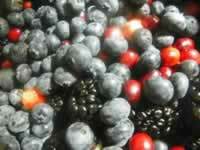 Use your choice of dark, purple berries, blueberry, blackberry, bilberry, or elderberry. The brandy not only preserves the goodness of the berries, but also extracts the medicinal benefits. These fall fruits are all good sources of antioxidants that support healthy aging and cardiovascular health. No wonder these delicious berry cordials have always been a part of our family traditions. Cap tightly. Stash in a cool, dark cupboard for 4 to 6 weeks before opening, shake the jar every so often. Decant into glass bottles by pouring from the top, leaving any sediment that has settled to the bottom of the jar. Makes a great gift in a fancy bottle.